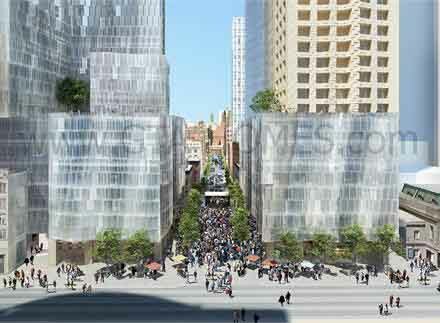 Mirvish + Gehry Condos Coming Soon to Downtown Toronto! Mirvish + Gehry Condos are coming soon to downtown Toronto, Ontario. It is a new mixed-use condominium development currently in pre-construction at King Street West and Simcoe Street by Great Gulf. It is a proposed 2 towers with 82 and 92 storeys respectively on a 6 storey podium and 1,949 residential units. These towers will be situated in an iconic landmark making it a very desirable location for both buyers and investors. "Mirvish Productions was founded in 1986, by David Mirvish, for the purpose of administering and producing shows for Toronto's historic Royal Alexandra Theatre." Princess of Wales Theatre - A theatre construction of 2,000 seats in 1993 which co-produced the successful Miss Saigon musical follwed by the Beauty and the Beast, The Lion King and The Sound of Music musicals. They have also purchased the 2,300-seat Canon Theatre and the 700-seat Panasonic Theatre. They also own the Ed Mirvish Theatre and The Royal Alexandra Theatre. "Great Gulf has specialized in complex jobs demanding innovative solutions for over 20 years." Monde Condos - A condominium development currently under construction and is selling with 44 storeys and 516 units located in the East Bayfront. Unit size range from 483 square feet to 1655 square feet with prices from $339,900. The project is slated to be completed in 2018. 8 Cumberland - A mixed-use condominium development with 51 storeys and 414 luxury residential suites. The project was a success and sold out within a month of launching. And the list goes on,Great Gulf has many more other projects as well. Finally, there's this project: the amazing Mirvish + Gehry Toronto Condos, a collaboration from Great Gulf & Frank Gehry. which will result in a living urban community close to the finest art, culture and design life that Toronto has to offer.